Reader Question: Who’s Behind the MLK Signs? But then, contemplating the wealth of powerful quotes from a fine orator, she started to have an idea: “How about if everyone had quotes? 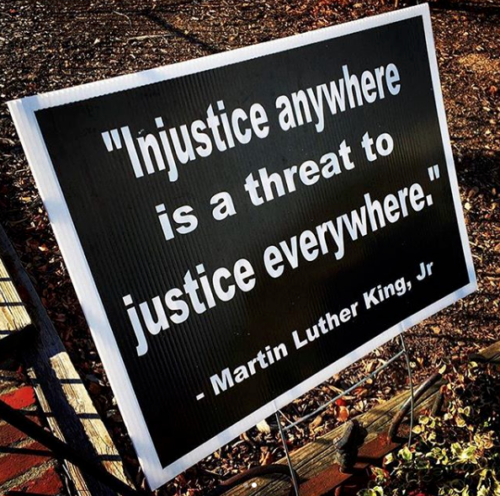 [Dr. King] said so many good things, what if people had different quotes in their yard?” Although she realized this could be perceived as a political statement, it could also be a way to bring neighbors together: What kind of ideas do we want to uphold? What kind of values define us? Van Achterberg went through supercheapsigns.com and designed her own series of simple signs with several quotes. She went around to her neighbors, asking them if they would like a sign, remembering how in past inauguration days people have walked down East Capitol Street and other main thoroughfares around Capitol Hill. What she did not expect was the response. What started as just a simple ask from neighbors– share an inspirational sign– became a movement that inspired other neighbors to reproduce similar quotes in a slightly different layout. “What’s surprised me most is how long people have kept [the signs] up,” she tells me. Neighbors and strangers wanted signs so much, they even offered to cover costs of printing. She set up a Facebook page, MLK Signs, which you can still follow, although van Achterberg is taking a break for now. I have eight signs to give away, left over from a last printing. If you want a sign, leave me a comment! We’ve been wondering where these came from and would love one! There is one sign with your name on it. Will email you shortly! Maria, may I have a sign too? Sure thing! You’re on my list. Of course! I’ll email you. Maria…I would love a sign for my Brookland house if you still have one. I’d love a sign as well! I run on the Hill and often around Lincoln park and am comforted when I see a sign in the yard! I’d love a sign please, I live on the Hill and missed when they were given out.